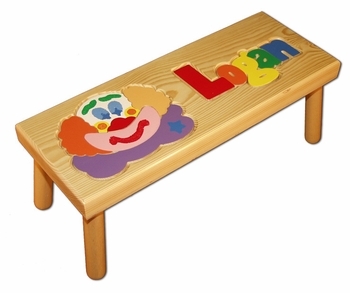 Great as a new baby gift or for their first birthday this custom baby name seat includes a colorful six piece clown puzzle in addition to the baby’s name built into the top of the seat! Baby’s always enjoy puzzles and they love these stools built just for their size and with their name as a block puzzle built right in. The puzzle pieces are finished with non toxic paint for safety and the name has a maximum of 8 letters with spaces. Proudly made in the USA as they have been for over 40 years, each one is fabricated from a solid piece of furniture grade solid pine and will withstand generations of use! The seat top is 9 inches high and measures 9 by 24 inches. If you would like to add another element of customization, we can also engrave the seat bottom with the baby’s birth date, weight and height or even a personal message to the child to commemorate the event!